In 2013, Topshop introduced its "Mom Jeans" style—high-waisted, cropped, stiff straight-leg jeans. Five years later, they are still a key silhouette for the retailer. However, others have dropped the "mom" from the label of these jeans and have returned to calling them vintage-inspired straight legs. Selfridges's denim studio has over 11,000 pairs of jeans, so it seemed like the obvious place for me to try to find the best pairs. Initially, I was told by a sales assistant that there were no mom jeans in the store—making it clear that this cut has gone under a rebranding this year. Mom jeans now go by the name "high" or "mid-rise" straight-leg jeans and usually have the word "vintage" used somewhere in the description. In 2013 the mom jeans backed by Topshop were predominantly in a light, bleached wash, however, this year's styles aren't as Saved by the Bell and come in darker, more classic washes. Keep scrolling for the four pairs that I think are the best around. My verdict: Mother is my favourite denim brand, and I liked how these were an update on a classic mom jean. They have the high waist and the vintage feel wash but have a slightly flared kick rather than a tapered rolled-up trouser leg. I am usually a size 28, but I always size down in Mother, so these are a 27. 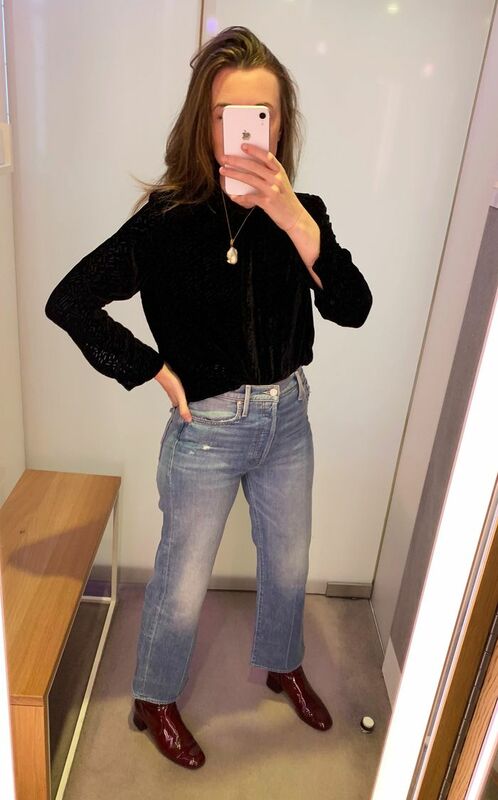 My verdict: Next, I tried on Topshop's famous Mom Jeans and went for a size 28. I like the high-waist, however, I unrolled the cuffs on these, as they look a little more classic with a straight leg. My verdict: These were my favourite pair by far and looked good in every single one of the pictures I took in the changing rooms. The same can't be said for the other pairs. Again, I sized down with these jeans and found the 27 was the best fit. My verdict: I also loved the wash of these Lee jeans, which are the pair I would probably choose to buy at £130. I would stay true to size or go up a pair in these (mine here are a 29). These are the only jeans I could find in Selfridges's denim hall with the name "mom jeans" on the label. Next up, see our guide to the key denim trends we're into right now.